The Old Dairy - with a hot tub (28819) - Manor Farm, Tattersett, Wells Next The Sea, Norfolk. The Old Dairy - with a hot tub (28819) from Hoseasons - Manor Farm, Tattersett, Wells Next The Sea, Norfolk. We (I say we - that's two parents, one eight year old and one four year old) took our short break at The Old Dairy, on Manor Farm, near Wells-Next-The-Sea, Norfolk for a relaxing short break. The Old Dairy is a modern holiday cottage, converted from, well, an old dairy - the name of the cottage gives it away! Other cottages are also being developed on the same farm; although The Old Dairy is the only one to feature a splendid hot tub. On arrival at manor Farm, we were greeted with the steaming outside hot tub situated next to the cottage. More concerning for me, being 6ft tall, was the door. This couldn't have been more than 5ft in height! And I had visions of being on my hands and knees for the weekend. Any fears on the vertically challenging nature of our holiday cottage soon subsided, as there is plenty of head-room once inside. The Old Dairy is a newly converted cottage, with many of traditional features remaining; exposed beams and flint walls all help to give this cottage a traditional feel. The cottage has a double bedroom, which us two parents claimed, a bathroom, living room and kitchen/dining room. A spiral staircase leads up to a galleried landing, off which are situated two twin bedrooms and a shower room. The twin bedrooms were ideal for our two children. They loved having a bedroom each. I should point out that cottage description says that the cottage isn't suitable for under 10s. This is because of the spiral staircase and galleried landing. Our four and eight year old had no problems with this though. Once the kettle had boiled, it was time to take a cup of tea outside, and experience the delights of the hot tub. The hot tub is a lovely large round affair, with plenty of room for both us parents and the children. The hot tub is a truly magical experience, the whole family laying in the hot water as the sun disappeared behind the trees, listening to the sounds of the local fauna. Manor farm is still a working dairy farm, although you won't have any problems with the cows sharing your hot tub; as they are kept well out of reach. The Old Dairy comes highly recommended by us! 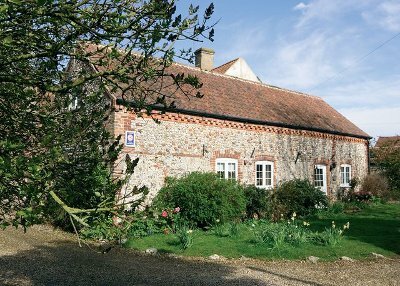 Suitable for anyone who wants a quite, relaxing break in the North Norfolk area. Suitable for families (mind the spiral staircase), friends and couples. Come and stay at The Old Dairy because it's fun for everybody, with flint and stone walls and plenty of living space. I think the best features are the four sky lights that let in plenty of light and the spiral staircase which leads to a galleried landing. The beds are snugly and the chairs are nice, especially the one that spins. But what I really like is that it used to be a dairy. Sitting in the hot tub looking at the green surrounding is a nice and calm relaxing way to spend your day. There are other cottages, but our one is the only one with a hot tub. What makes it especially good is that it is circular, quite big and can fit six people in it at one time. The lid is easy to put on and there are steps to be used to get in and to get out again. As you drive down the country road and down the drive way to your cottages, you are surrounded by lots of different breeds of birds flying around and sitting in the dark green trees bushes and plants. If you decide to have a walk, have a look for some cows because after all manor farm is a working cow farm and there are some horses too. Over all I would give the old dairy ten out of ten.